Back workouts are a dime a dozen but how many really get you that awesome V-shape? Here’s 4 back exercises and a back workout routine to fry your lats. Years of training has led me to try dozens of back workouts over my fitness career. I’ve found that some of them work great and others are just thrown together so that there is content in the magazine for the month. The back workout that you are about to see is one that will leave you lying on the floor, literally. Team Body Spartan member Brandon Griffith was put through the ringer by yours truly earlier today and the result was the picture you see here. That, and the fact that he kept saying he was going to throw up. If you attack your back workouts with this kind of mentality, thinking you are about to unleash the beast and pushing yourself beyond what you thought you were capable of, you will have the back of champions. On that same note, and before I dive into the actual back workout, I need to stress the importance of the mind-muscle connection. This is the connection between your mind and your muscles at the point when you are about to give up. Our minds are incredibly powerful and each person has the ability to control their muscles, to push them beyond their boundaries, and to fight and work through the pain. When you master the mind-muscle connection, you will understand your true capabilities. One of the things I do before my back workouts (and any workout) is listen to CT Fletcher and visualize my back workout. It’s important to see yourself moving the weight and completing your sets with authority. I downloaded several of CT Fletcher’s videos and ripped the audio to a playlist. CT Fletcher is one of the most motivational fitness people on the planet. He’s known for pushing people beyond their boundaries and pulling the champion in you to the surface. Below is one of the videos I watch almost daily and have the audio ripped to my playlist. At 10:06, CT Fletcher discusses the mind-muscle connection and I can’t stress how life changing it was for me. 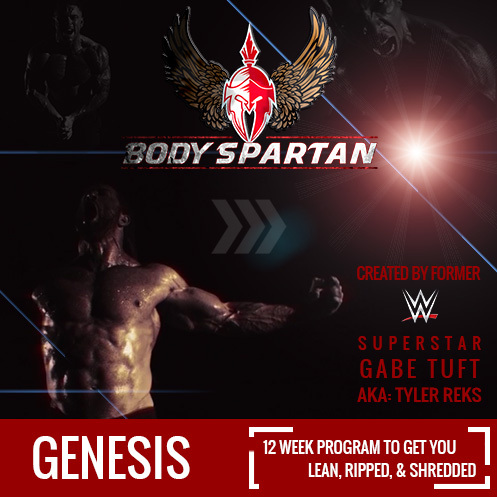 Now that you’re pumped and are focused on the mind muscle connection, let’s dive into this Body Spartan back workout. I’ve included the weight that we used for reference. Please be sure to use a weight that is right for you. Hammer strength lat pulldowns, supinated grip (thumbs facing you). Pick weight that will push you to the limit in your back workouts. On every set you should be working past the point of fatigue to where you have to recruit all of your mental power to knock out the last two or three reps. You have got to want the pain, to love the pain, to seek the burning sensation in your muscles. That is what separates the good workouts, from the great ones. It’s also what separates the champions. I know there’s a champion in each one of you.